If green happens to be your favorite color for your design needs, we offer multiple shades of Sunbrella green fabrics that will go with any room. 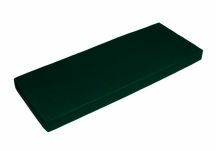 For anytime of the year, our Sunbrella Forest Green Bench Cushion has been one of our best sellers for more than five years now. If a green stripe is in the mix of choices and your bench is going poolside or by the beach, we recommend the ever-popular Sunbrella Seville Seaside Bench Cushion. Both the green and blues stand out beautifully in this fabric!